Episode 5 featuring Julian Gray is ready for your listening pleasure… You’ll find the show notes/ highlights below! You can find Julian Gray online in numerous places, including his website, YouTube and Twitter. Julian grew up with eclectic tastes in Maryland, outside Washington DC and as a result, his sound draws on numerous genres. His mother was into new-wave and rave from the 90s and his dad (a guitar teacher) leaned more towards classic rock (Pink Floyd, Fleetwood Mac, etc.). 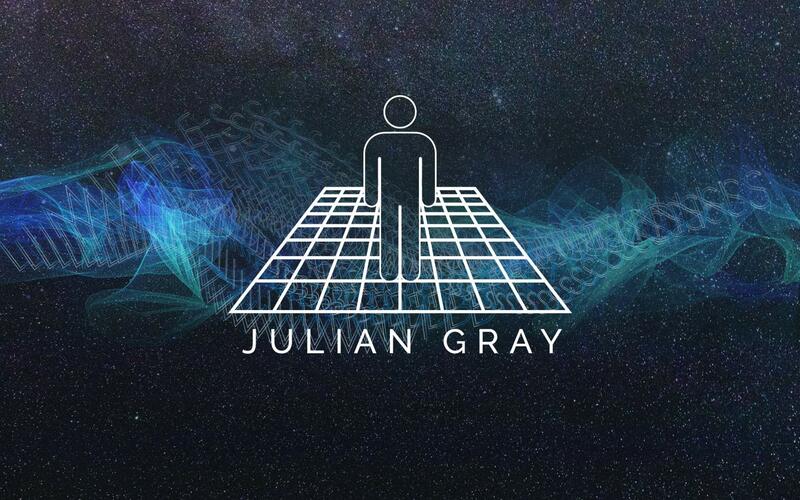 The Julian Gray “sound” combines: the groove of techno (kick-clap); the rolling basslines and arps from trance; the glitches, bass work and cuts from electro; and tonal and melodic elements from classic rock. Given this variety, Julian Gray doesn’t take genre into account when writing music. When he was young, Julian listened to a range of artists but if he had to pick an album that inspired his move into electronic music, it was either Discovery by Daft Punk, or 4x4=12 by deadmau5. A friend was really into “house” and gave Julian a copy of every single Daft Punk album but hearing _4x4=12_ was the turning point. In that album, he heard the culmination of Daft Punk’s sound, the melodic rock tones he loved and the heft of Nine Inch Nails and thought “this is what I want to write”. His favourite deadmau5 was actually the next album >Album Title Goes Here<, which he actually queued up to buy. Julian Gray is a talented musician as well as producer and took classical training in trumpet for about eight years, which isn’t directly applicable to his production career. However, the experience did give him a firm grounding in music theory and how to layer harmonics and melody in an orchestral setting, which has helped to shape his sound and approach. He has taught himself piano and guitar and plans to experiment a lot more with these instruments and his vocals in future. Unlike many other producers, Julian started DJ’ing before producing, using some basic, sub-VirtualDJ software and a mouse to put mixes together. Music production came later, when his dad brought home a soundcard with a free DAW included: the save functionality was disabled and Julian Gray had to complete songs in one session … but he still managed to complete his first album when he was just 13! Hitting 10K subscribers on YouTube was a big personal milestone. Run was his first track with a vocalist and narrative music video. Navigate was a big milestone: he had been trying to finish the track for 3 years, through about 600 revisions and it was his first song to break 100k plays. It’s a monument of those three years in his life and he also used a lot of video taken during that time to put the music video together. The highlight is definitely “Resident Try Hard” being featured on the Foar Moar series. He built the track around the samples of deadmau5 and was surprised that he cleared it! One other thing Julian is proud of is Collab Alliance, a collaborative project between a group of producers to finish a track. Julian thinks it’s really cool that the whole process is on camera for people to see and it was a lot of fun. They wanted to do a season 2 but everyone became too busy to manage it. Julian is known as an Ableton user, from the many tutorials and tips he shares via his YouTube Channel. His channel actually started out with DJ tutorials but he grew into addressing Ableton and other broader music-related topics over time. Through his YouTube channel Julian has developed relationships with a lot of plugin manufacturers and reviewed their products. He found that once he reached a certain size or “clout” people started coming to him, rather than the other way round. This has given him a useful perspective on how overwhelming the market is and he has dialled in on his favourites. On the hardware side, Julian’s dad owns an MS10 (a small single-oscillator synth from the 1970s) but when Julian moved to LA he left it behind. He now works almost entirely in-the-box and uses the Novation Launch Control XL for its fader functionality, as well as the Ableton Push controller. As Julian envies his friends that have Moog and modular hardware systems but he finds that direction a bit bulky and unwieldy, so his dream piece of equipment would probably be an insanely good audio converter, or a top-end Mac Pro. Speaking to a lot of pop producers he knows, they all produce in-the-box and swear by really good conversion. Julian became burnt out on DJ’ing from doing it so much and now prefers live performance. He does miss the speed and simplicity of dragging-and-dropping tracks onto a USB and walking into a club but with Ableton plus midi controllers you gain a lot of power and flexibility. When it comes to creative block, Julian doesn’t really have an issues because he does a lot more than just music. He edits video, produces graphics, does web development and software design and whenever he feels burnt out on one avenue, he just jumps to something else and will usually come back feeling refreshed. Hanz and Julian discussed some points on branding for musicians, which Julian covers in more detail in this video. In short, the most important things are awareness and consistency: you need to have an easily identifiable hook that encapsulates everything you put out and how you present yourself (see: NoMana, deadmau5, Marshmello). Julian also had some tips on how to get booked for live shows. Most important is to establish yourself as someone worth booking, which can be done through one of two ways: play as many live shows as possible, to improve your skill and standing and people will seek you out because you can put on a good show; or, if your music is good enough, you can get booked just off the back of your music (e.g. NoMana’s first show in support of deadmau5). Oggie James and his “Bump in the Hump” radio show, for his on-going support of emerging electronic music.